North Korea’s successful test of the Kwangmyongsong satellite launch vehicle raises questions about its ICBM progress. While there’s a lot we don’t know yet about just how evolutionary Sunday’s launch was over its predecessor in 2012, Melissa Hanham of the Center for Nonproliferation Studies at the Middlebury Institute of International Studies has a useful round up of just what we do know. In particular, I’d highlight the preliminary image assessment of the outside appearance of the rocket, which is confusingly called the Kwangmyongsong (not to be confused with its satellite payload, which is the Kwangmyongsong-4 satellite). Hanham notes a “perfect fit” between the chassis of the 2012 launch device and the Kwangmyongsong rocket. Similarly, the first and second stages of the Kwangmyongsong launch device have very similar splash zones to the 2012 Unha-3 rocket. Hanham notes that this suggests that the internals of the rockets might not have been too different. The payload and third stage of the rocket remain in orbit. As of this writing, it’s not known if North Korea has been able to successfully transmit information to or establish communications with the Kwangmyongsong-4 satellite. 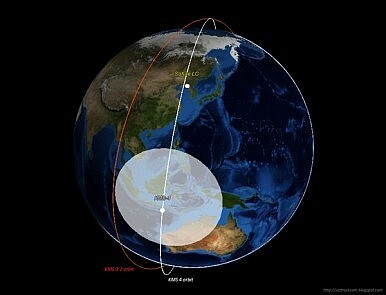 In 2012, the Kwangmyongsong-3 was able to transmit data at a downlink frequency of 470 MHz. In 2012, we learned a lot more about the Unha-3 after experts were able to analyze the components recovered from the wreckages of the first and second stages of the rocket. A 2014 United Nations Security Council report summarized these findings, noting that while most of the components were domestically made and assembled in North Korea, several foreign-sourced components were found in the debris, including parts manufactured in the Soviet Union, the United Kingdom, China, the United States, and South Korea. We’ll no doubt learn more about Sunday’s launch going forward. North Korea appears to be intensifying the rate of its missile and nuclear weapons technology testing. Between December’s the KN-11 submarine-launched ballistic missile ejection test, January’s test of what was likely a boosted fission bomb, and Sunday’s Kwangmyongsong launch, Pyongyang appears determined to push ahead with its goal of attaining a reliable nuclear device and delivery vehicle. But if the Unha-3 is intended for use as an ICBM, it’s not a very good one. The second- and third-stage engines don’t have enough thrust to efficiently deliver heavy warheads; a militarized Unha might deliver 800 kilograms of payload to Washington, DC. The North Koreans can probably make a nuclear warhead that small, but it would be a tight fit. With bigger upper-stage engines, which we know the North Koreans have, they could deliver substantially larger payloads. This would allow bigger and more powerful warheads, more decoys to counter US missile defenses, and a generally tougher and more robust system. The Unha is also too heavy and cumbersome to be survivable in wartime. Too big for any mobile transporter, it can only be launched from fixed sites. Its highly corrosive liquid propellants require hours of pre-launch preparations. That’s a bad combination for North Korea; their fixed launch sites are going to be watched very closely, and particularly in a crisis, any indication that an ICBM is being prepared for launch could trigger a pre-emptive strike. Despite North Korea’s two successful tests of multi-stage satellite launch vehicles in 2012 and now 2016, Pyongyang hasn’t shown that it will be able to use its existing technology to deliver a nuclear device. Miniaturization of its existing nuclear weapons is one area of concern. Intelligence assessments from the United States and South Korea differ in their confidence that North Korea has successfully miniaturized a nuclear device. North Korea claimed to have done so in May 2015. Meanwhile, after all we’ve seen from North Korea in the past few months, a fifth nuclear test may be in the offing soon, according to South Korean intelligence. North Korea's ICBM: A New Missile and a New EraRussia and China Have a Common Line on Resolving the North Korean ProblemNorth Korea Announces That It Has Successfully Tested Its First-Ever ICBMIs North Korea About to Welcome Donald Trump Into Office With Its First-Ever ICBM Flight Test?2017: Year of the North Korean Intercontinental Ballistic Missile?